There is a whole following of people who love this book. I had not heard of it until years into my career. It’s something of a cult classic. I definitely recommend it. Probably one of the top 5 management books out there. What is the ultimate goal of any organization? And how do you go about achieving that goal? This book is a fictional account of a plant manager trying to figure out how to improve performance in his factory. 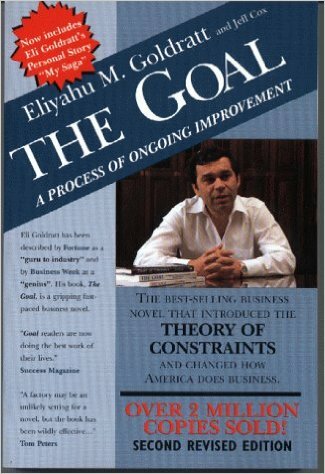 It establishes the theory of constraints — a primer for solving pretty much any enterprise challenge — and is told in a fictional style that makes it easy to retain the lessons. The Goal of a factory is to make money; everything else is secondary. Identifying the constraints preventing the achievement of that goal usually results in a surprisingly short list of “bottlenecks.” Recognizing these bottlenecks and improving their performance should have a direct impact on the goal. Figure out what needs to be changed, what it needs to be changed to, and then determine how to execute that change. Sounds easy, right?! I will admit it: I did not read this book. I listened to the audiobook. A lot of people will say that’s not real reading. Know what I call those people? Haters. The audiobook is great because there are voices and characters and it’s like listening to a B-rate production. But combining that with the fictional story about the factory really made these lessons stick, and I genuinely enjoyed reading (yes, READING) this book. And I realize how nerdy that sounds. My key take-away is that I can now direct people to the theory of constraints. Google that term and learn it, or better yet, read the posts below and get a sense for it. The posts below walk through the book’s key concepts.